In this picture (from left to right) Assistant Professor of Music-Woodwinds Michael Gersten, Assistant Dean for the Fine and Performing Arts William Buhidar, and Director of Grant Development, Management and Compliance Dr. Virginia Champion. Assistant Dean for the Fine and Performing Arts, William Buhidar, voiced his excitement for the music department. 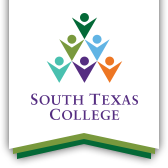 “This is the second grant that South Texas College has been awarded from the Wells Fargo Rea Charitable Trust Foundation, and we are very pleased with their commitment to support the music department with this $60,000 grant, which is double the size of the initial grant we received."